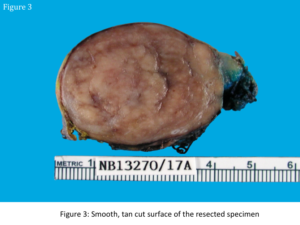 A 41 year-old lady, with no relevant medical or family history, presented with sharp right flank discomfort for 2 days and weight loss of 3 kilograms over 1 month. 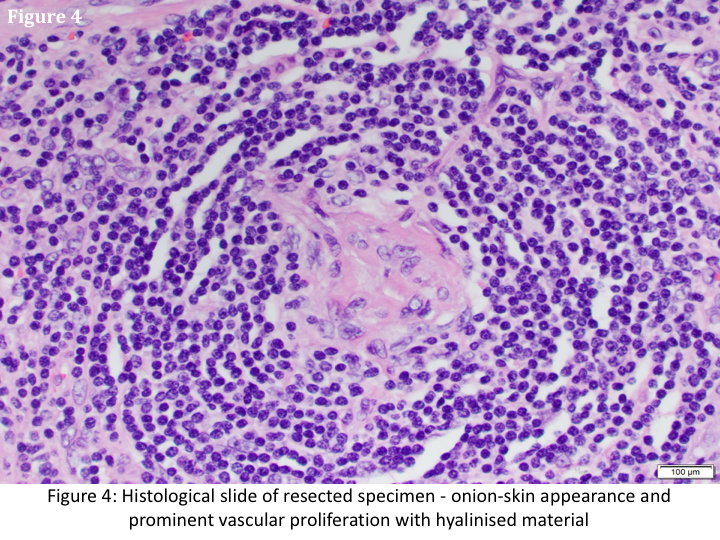 Aside from mild right flank tenderness, no other abnormality was noted on a multisystem clinical examination. She had normal leucocyte, hemoglobin, and liver function levels, a negative Hepatitis screen, and normal tumor markers (Alphafetoprotein, Cancer Antigen 19-9 and 125, Carcinoembryonic antigen). Urine metanephrines were not elevated. 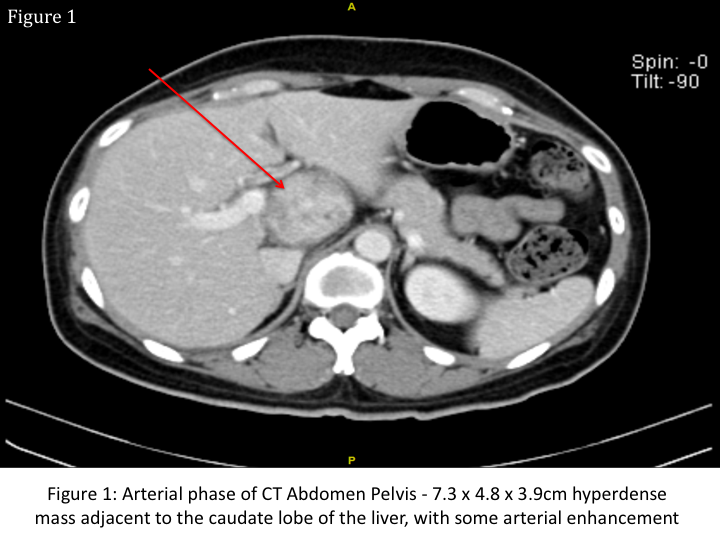 Computed Tomography (CT) and Primovist enhanced Magnetic Resonance Imaging (MRI) scans suggested a well-defined mass adjacent to the caudate lobe of the liver with arterial enhancement and no significant washout in the portal venous phase (Figures 1 and 2). She then underwent an exploratory laparotomy. 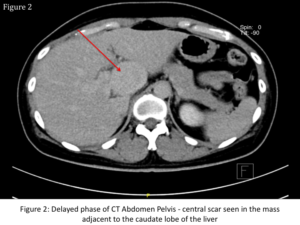 A 7cm capsulated lesion in the retroperitoneum adjacent to the inferior vena cava and caudate lobe was identified and resected. 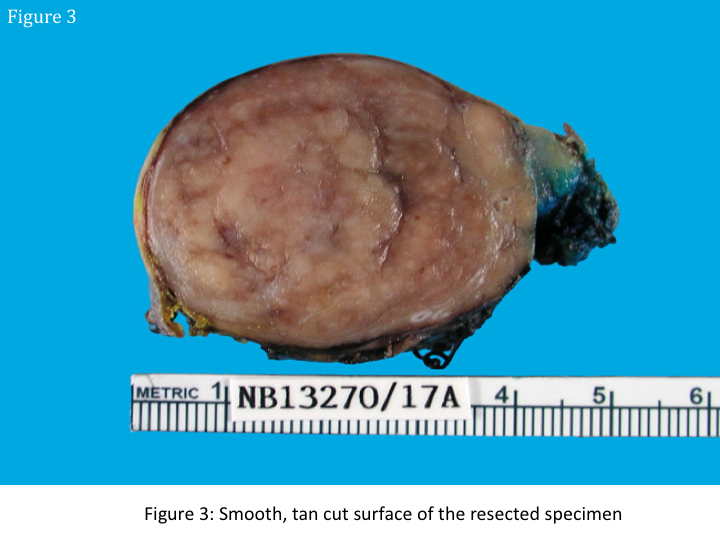 The sliced specimen had a smooth, tan cut surface (Figure 3). 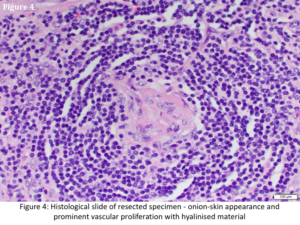 Histopathological examination revealed an onion-skin appearance, and prominent vascular proliferation with hyalinised material (Figure 4). What is the diagnosis?